← Sigma 70mm F2.8 EX DG Macro – Still Going Strong. Who is the real Pentax Distributor in Singapore? sort of stolen identity and controversies surrounding the brand Pentax in Singapore. (better known as APD Singapore). details. 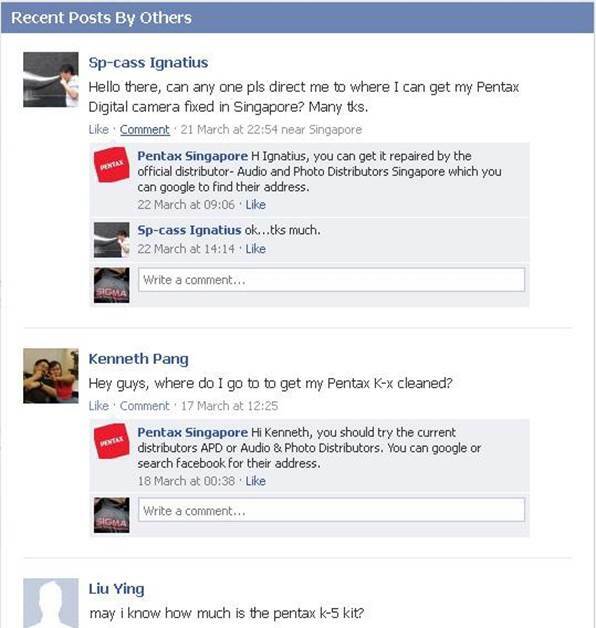 A quick check on the “Pentax Singapore” facebook included links to PENTAXWEBSTORE.SG which is not managed by the current distributor APD Singapore. On the web page, the page owner also claimed that they are the “Official Pentax Distributor in Singapore” which further confuses the public into La-La-land. the exclusive distributor for all PENTAX Brand products from DSLRs, Lenses, Compact Cameras, Binoculars & Accessories. He further confirmed that there is no other “official distributor” in Singapore. However Kenny added that likely, there might be others who parallel-imported these units in for sale in Singapore. He also mentioned that it is possible to trace the origins of the product from the serial number that runs on a world0wide system. Buying these “grey sets” are not encouraged, he added. Below are some of the screen shots sent in by the reader who alerted us. This entry was posted in Brand: Pentax, Photography Articles & Videos, Uncategorized and tagged APDS Singapore, News, Pentax. Bookmark the permalink. 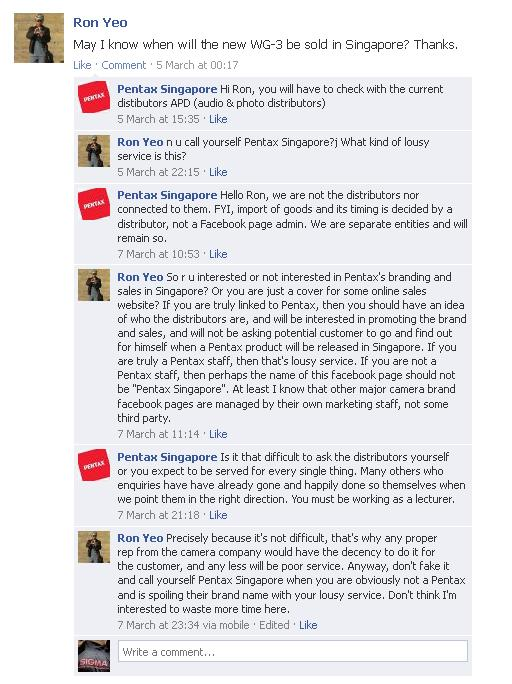 2 Responses to Who is the real Pentax Distributor in Singapore? Aiya. When Emjay become the distributor for Pentax, they setup that Facebook page. Then when they lost the distributorship, they didn’t close the Facebook page or transfer to the new distributor. I think the problem here lies with Pentax. They shouldn’t allow distributor to setup the Facebook page. A better solution will be for Pentax to setup the Facebook page and let the distributor manage it. When they change distributor, the management of the Facebook page should be transferred to the new distributor. Anyway, the new distributor can simply lodge a complain to Facebook to get that page shut down and setup a new page.